After the Note 7’s two recalls and ultimate cancellation, there’s been a tremendous amount of pressure on Samsung to get the Note 8 right. After using the device during a hands-on session, there’s a lot to like, even if none of it is particularly surprising. You can read more about the technical specs here. The design is also what you’d imagine: A slightly boxier S8+. The phones have very similar dimensions, but Note 8 is just a teensy bit taller and wider, and the corners are a little less rounded. And despite the 6.3-inch screen, the Note 8 is still just about the same size as an iPhone 7 Plus. Otherwise, it’s the same elegant metal-and-glass design language we’ve come to expect from Samsung, with the same poorly placed fingerprint sensor. Personally, I think the backside is getting a teensy bit stale, but it’s still among the better looking phones out there. The Deep Sea Blue is particularly gorgeous, but it’s unfortunately not coming to the US — at least not at launch. Navigating the device was silky smooth. We’ll see if that remains true in the long term — the S8 has fared well for me, and the Note 8 more RAM, so here’s hoping performance holds. It comes with Android 7.1.1, though Samsung promises an update to Oreo soon. There are a couple of new software features this time around. You can now quickly assign shortcuts to a launch pair of apps in split screen mode right from the Edge panel, which is handy if you’re the type of person who often does work from their phone (the Note 8’s target market, of course). Meanwhile the S-Pen is basically unchanged, but you can now draw animated scribbles called “Live Messages,” which you can then share with friends. You can also use it to annotate or draw on photos, which is a lot of fun to mess around with. 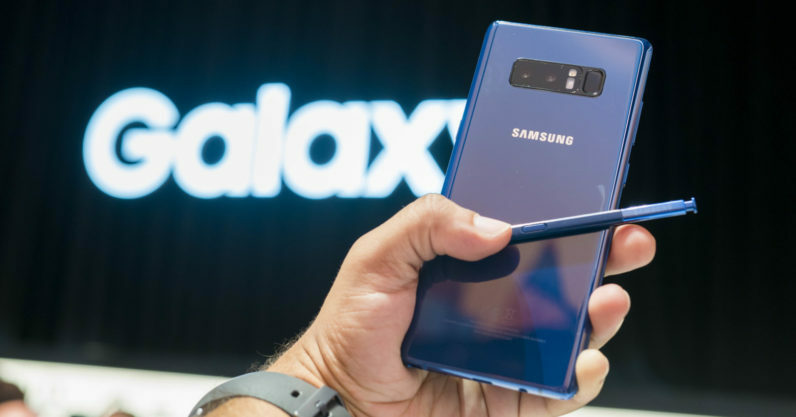 But for all the productivity and pen features on the Note 8, the most notable addition is decidedly mainstream: a dual camera system with background-blurring portrait mode. Shooting at a crowded press event is hardly a good setting for camera tests, but at first glance the portrait mode – which Samsung calls Live Focus – seems on par with the competition. The artificial bokeh had a pleasing quality to it, and it did a decent job of separating my head from the blurred background. There were a couple of artifacts around complicated edges (like my curly hair), but I’ve yet to see a phone that can avoid them completely. Barring any flammability disasters, or poor battery life, the Note 8 is likely to be a superb phone. It’s the only phone that effectively embraces the stylus, the specs are best in class, and it’s not half-bad to look at either. But at first glance I’m not quite as excited about it as I was for its predecessor. But this year the competition is stiff. LG’s imminent V30 is rumored to have even smaller bezels, better audio, and unique camera features of its own. Andy Rubin’s Essential phone – which I’m currently in the process of reviewing – feels decidedly more premium. And then there’s the iPhone 8, which is supposed to be Apple’s most significant release since the original. You could even argue Samsung is cannibalizing itself this time around, given the difference in screen size between the Note 8 and S8+ is negligible. The Note 8 may have dual cameras, more RAM, and a stylus, but the S8+ is significantly cheaper (~$675 street price, compared to $960 for the Note 8), and has a bigger battery. If anything, I have the sneaking suspicion Samsung purposefully held off on the dual cameras on the Note 8 to help differentiate it from the mainstream S8. Still, these are just my first impressions, and just because it doesn’t stand out as much as its predecessor doesn’t mean it’s not a great a phone. Obviously, if the idea of a stylus entices you at all, or if you simply need the biggest screen you can get on a flagship, there isn’t much else worth considering. Stay tuned for our full review once we can spend more time with the device. If you’re looking to get your hands on one, pre-orders begin tomorrow and the device officially launches on September 15.